“Great for turning handwritten notes into text without the need for a PC, but it’s only available for iOS. The Livescribe 3 is a smartpen that lets you take notes anywhere, such as in meetings and lectures, and transfer those notes to your iPad or iPhone. You can then turn those handwritten notes into text to edited and distributed to other people with the Livescribe + iOS app. The Livescribe 3 uses the same technology as its predecessors to capture every detail of what you write or draw. 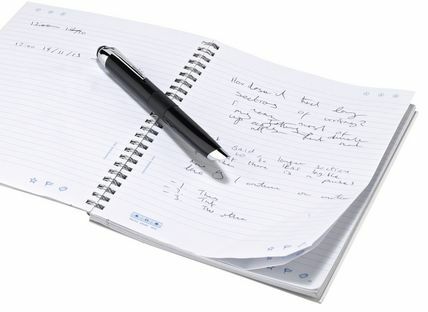 A built-in infrared camera detects the location of the pen’s nib on special paper that has a non-repeating dot pattern. You can either buy dot paper or print the pattern using a laser printer. The standard version we reviewed comes with a 50-page starter notebook. Like previous Livescribe pens, the 3’s internal storage keeps digital copies of everything you write on the paper. Unlike its predecessors, LiveScribe 3 is designed for use with an iPad or iPhone using the Bluetooth Low Energy (BLE) standard. It can transmit everything you write on the dot-paper pad to the Livescribe+ app on your iPad almost in real-time. As BLE doesn’t consume much power, it’s feasible to keep tablet and pen paired and active for extended periods of time: the pen has an advertised battery life of 14 hours. Unlike previous models, the Livescribe 3 looks and feels like a proper pen with a retractable tip. You extend it by twisting a metal ring at the centre, which also switches on the device. A Micro USB at the back of the pen, which is used to charge it, is covered by a rubbery cap that doubles as a broad stylus. It’s no good for fine control or writing, but it’s handy for controlling your tablet without having to put your pen down and makes scrolling through your notes easy. The Livescribe 3 is much lighter than previous versions, but it doesn’t have the built-in screen and voice recorder that previous versions had. 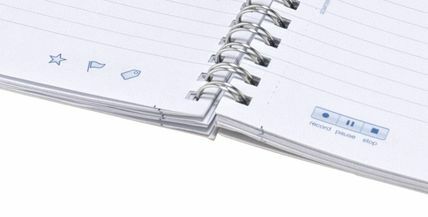 You can use the special dot paper in the notebook to record, pause and stop audio recordings in the Livescribe+ app. The paper also has icons that you can use to add pages to different categories: flagged, tagged and favourites. Livescribe has made it very easy to access powerful functions such as handwriting recognition and turn your notes into a usable digital form. When it comes to handwriting recognition, the app supports English, German, Spanish, French and Italian, as well as a few regional variations.